Pakistan’s Supreme Court has acquitted opposition head Nawaz Sharif of hijacking charges, removing the final ban on him running for public office. Mr Sharif was found guilty of hijacking then army chief General Pervez Musharraf’s plane in 1999, when he ordered it to be diverted. Mr Sharif was then toppled as prime minster in a coup led by Gen Musharraf. He was convicted by the Sindh High Court but he has always maintained that the charges were politically motivated. Mr Sharif’s government had ordered officials to divert Gen Musharraf’s plane away from Karachi and to a smaller city in Sindh. While he was imprisoned, Mr Sharif agreed to go into exile under a deal with Gen Musharraf who had taken over as Pakistan’s president. 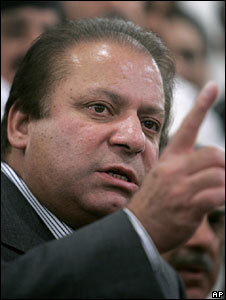 Mr Sharif ended his exile ahead of the 2008 elections but was prevented from contesting due to the court conviction. Pakistan’s president and prime minister were swift to congratulate Mr Sharif on the court ruling. Mr Sharif’s acquittal will be viewed as a positive development which helps strengthen democracy. It also puts Mr Sharif on an even keel with President Asif Ali Zardari of the ruling Pakistan People’s Party (PPP). Charges against him were withdrawn from court by the earlier Musharraf government in the name of “national” reconciliation. But the court verdict restores to the political stage a potentially formidable opponent to Mr Zardari, correspondents say. Mr Sharif has held office previously and can point to substantial political support across the country. In its ruling on Friday, the Supreme Court said there was no evidence to support the charge of hijacking and acquitted Mr Sharif. “Looking at the case from any angle – the charge of hijacking, attempt to hijack or terrorism – does not stand established against the petitioner,” news agency AFP quoted from the Supreme Court ruling. “The conviction and sentence of the appellant are set aside and he is acquitted,” the order said. The “petitioner had neither used force nor ordered its use and undisputedly no deceitful means were used,” it added. The five-judge court headed by Justice Tassaduq Hussain Jillani heard the petition in June, but initially reserved judgement. Mr Sharif’s Pakistan Muslim League-N (PML-N) party has welcomed the order. “A judgement given by a kangaroo court nine years ago has been nullified by an independent and sovereign apex court in the light of the constitution, law and evidence on record,” PML-N spokesman Siddique-ul-Farooq was quoted by AFP as saying. In May, the Supreme Court had overturned a ban that prevented Mr Sharif and his brother Shahbaz from running for political office. The ruling meant that Mr Sharif would be able to stand in elections due in 2013 or a parliamentary by-election before then. The former prime minister and leader of the PML-N party is one of the most popular politicians in the country. Interim President Roberto Micheletti has imposed an overnight curfew in Honduras, hours after being sworn in. 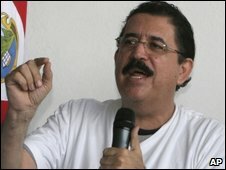 The Congress speaker took office after troops ousted elected leader Manuel Zelaya and flew him to Costa Rica. The removal of Mr Zelaya came amid a power struggle over his plans for constitutional change. Mr Zelaya, who had been in power since 2006, wanted to hold a referendum that could have led to an extension of his non-renewable four-year term. Polls for the referendum had been due to open early on Sunday – but troops instead took him from the presidential palace and flew him out of the country. Roberto Micheletti will govern until elections are held, Congress said. The ousting of Manuel Zelaya has been criticised by regional neighbours, the US and the United Nations. In the Honduran capital, Tegucigalpa, groups of Zelaya supporters were said to have set up barricades, while troops were at key sites. Mr Micheletti told a press conference that a nationwide curfew was being imposed for Sunday and Monday, running from 2100 (0300 GMT) to 0600 (1200 GMT) on each night. 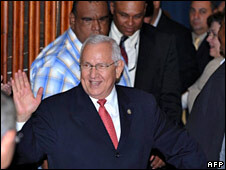 The swearing in of Roberto Micheletti – constitutionally second in line for the presidency – was greeted with applause in Congress. In a speech, he said that he had not assumed power “under the ignominy of a coup d’etat”. The army had complied with the constitution, he said, and he had reached the presidency “as the result of an absolutely legal transition process”. Congress said he would serve until 27 January, when Mr Zelaya’s term was due to expire. Presidential elections are planned for 29 November and Mr Micheletti promised these would go ahead. Both Congress and the courts had opposed Mr Zelaya’s referendum, which asked Hondurans to endorse a vote on unspecified constitutional changes alongside the November elections. Tensions over the issue had been escalating for several days, with the army refusing to help with preparations for the referendum. Just before dawn on Sunday, troops stormed the president’s residence. There was confusion over his whereabouts for several hours before he turned up in Costa Rica. Mr Zelaya called his ouster “a plot by a very voracious elite, an elite which wants only to keep this country isolated, in an extreme level of poverty”. He urged Hondurans to resist those who had removed him and late on Sunday flew to Nicaragua for a meeting of regional leaders. Congress said it had voted to remove him because of his “repeated violations of the constitution and the law and disregard of orders and judgments of the institutions”. In Tegucigalpa, groups of Zelaya supporters were setting up roadblocks around the presidential palace, Reuters said. One man told the news that he had been in the city’s main square all day, along with 2,000 Zelaya supporters. Jeronimo Pastor described the situation as tense and called on the international community to get involved. But another resident of the capital said people were relieved at Mr Zelaya’s removal. “Now we have a new president and will have elections and things will go back to normal,” Kenneth Bustillo told the news. The removal of Mr Zelaya has drawn criticism across Latin America and the wide world. The Organization of American States held an emergency meeting, while UN Secretary General Ban Ki-moon called for “the reinstatement of the democratically elected representatives of the country”. US President Barack Obama urged Honduras to “respect the rule of law” and a State Department official said America recognised Mr Zelaya as the duly elected president. The European Union called for “a swift return to constitutional normality”. Venezuelan President Hugo Chavez, meanwhile, blamed “the Yankee empire”, and threatened military action should the Venezuelan ambassador to Honduras be attacked. Iran’s Revolutionary Guards have threatened to crack down on any new street protests against the results of the country’s presidential election. In a statement, the guards vowed to react in a “revolutionary” way to suppress unauthorised demonstrations. The Revolutionary Guards, Iran’s elite security force, have close ties to the country’s supreme leader. On Friday Ayatollah Ali Khamenei banned protests, prompting street violence in which at least 10 people died. The streets of Tehran were quieter on Sunday but new protests are planned for Monday. Opposition supporters passing messages online said they planned to carry candles at a rally in Tehran in the evening in memory of those killed. In a statement posted on their website, the Guards said their troops would break up street protests and force protesters from the streets. “Be prepared for a resolution and revolutionary confrontation with the Guards, Basij [pro-government militia] and other security forces and disciplinary forces,” the Associated Press news agency quoted the Guards as saying. The plain-clothed Basij militia was involved in quelling earlier protests during more than a week of demonstrations against the re-election of President Mahmoud Ahmadinejad. The weekend violence led many Iranians to abandon protest plans. One regular protester, a 20-year-old student called Behrooz contacted by the BBC several times in recent days, said he was concerned he would be attacked if he took part. “My mother went to the demonstration on Saturday. She wasn’t hurt, but she saw guards attacking people and hitting them with batons,” he said. Results showed Mr Ahmadinejad won the 12 June election by a landslide, taking 63% of the vote, almost double that of Mir Hossein Mousavi, his nearest rival. Following complaints, the powerful Guardian Council, which oversees the electoral process, now says it has found evidence that more votes were cast in some constituencies than there were registered voters. But the number had “no effect on the result of the elections”, a council spokesman said on Monday. Speaking at a news conference, foreign ministry spokesman Hassan Qashqavi accused Western governments of explicitly backing violent protests aimed at undermining the stability of Iran’s Islamic Republic. “Spreading anarchy and vandalism by Western powers and also Western media… these are not at all accepted,” he said. The BBC and other foreign media have been reporting from Iran under severe restrictions for the past week. The BBC’s permanent correspondent in Iran, Jon Leyne, was asked to leave the country on Sunday. A key rally against Iran’s presidential elections will go ahead on Saturday – in defiance of Supreme Leader Ayatollah Khamenei – opposition sources say. The wife of defeated candidate Mir Hossein Mousavi, and an aide to another rival candidate, Mehdi Karroubi, said the rally would go ahead. Mr Mousavi later announced he would be giving a statement imminently. Police warned they will arrest the leaders of any protest rallies, which they said would be illegal. 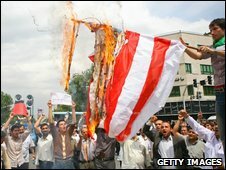 The warning follows an order from Ayatollah Khamenei on Friday that street protests should cease. The opposition leader Mir Hussein Musavi has not made the direct statement himself but his wife, Zahra Rahnavard, who has played a key role in his campaign, has said on her facebook site that the rally is going ahead. If so, this will be the most direct challenge to the authority of the Supreme Leader Ayatollah Ali Khamenei. A huge turnout is expected. Iran and the world will be watching to see how the Iranian security forces respond. On her page of the social networking website Facebook, Mr Mousavi’s wife Zahra Rahnavard said the rally would go ahead. An aide to Mr Karroubi also told the news that a rally would take place and that it would be attended by Mr Mousavi and Mohammad Khatami – the former president, key reformist and ally of Mr Mousavi. But the BBC’s Jon Leyne in Tehran says events are moving quickly, with the website of Mr Mousavi’s Kalameh newspaper saying he was due to make an imminent announcement. Mr Mousavi had been expected, along with fellow challengers Mr Karroubi and Mohsen Rezai, to discuss more than 600 objections they had filed complaining about the poll at a meeting of the Guardian Council on Saturday. But Iranian media reports suggest that neither Mr Mousavi nor Mr Karroubi turned up for the meeting. Our correspondent says that, if true, it might suggest they have abandoned their legal challenge to the election results. The Council, which is the body which certifies the election, had only offered a partial recount of disputed ballots from the election. 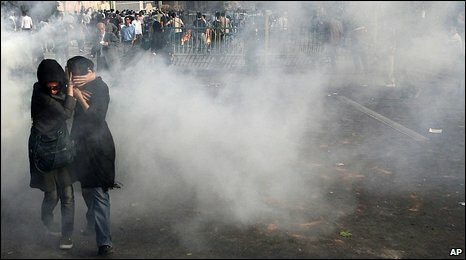 Iranian officials have warned protest leaders not to launch fresh demonstrations. Abbas Mohtaj – head of Iran’s State Security Council and also deputy interior minister – issued a direct warning to Mr Mousavi. “Should you provoke and call for these illegal rallies you will be responsible for the consequences,” he said in a statement. State TV also broadcast a warning by a senior police commander warning that police would not countenance any more street protests. Official results of the 12 June presidential poll gave President Mahmoud Ahmadinejad a resounding 63% of votes, compared to 34% for his nearest rival, Mir Hossein Mousavi. The result triggered almost daily street protests – a challenge to ruling authorities unprecedented since the Islamic revolution of 1979. The human-rights group Amnesty International says it believed about 10 people had been killed. On Friday, US President Barack Obama warned Iran that the “world is watching” events there. He expressed concern at “some of the tenor and tone of the statements that have been made”. A new rally on Saturday would directly challenge an order from Ayatollah Khamenei, Iran’s spiritual leader and highest authority. “Straight challenge is not acceptable after the election,” Ayatollah Khamenei told thousands of Iranians who massed to hear him on Friday. 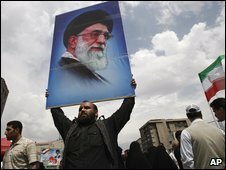 The ayatollah insisted the Islamic Republic would not “cheat voters” – and blamed foreign powers, in particular the UK, for fomenting the unrest. He said “bloodshed” would result if the protests went ahead. The rally was attended by President Ahmadinejad. But former President Ali Akbar Hashemi Rafsanjani – a close associate of Mr Mousavi, and open critic of President Ahmadinejad – did not attend. Although the Supreme Leader controls many levers of power, Mr Rafsanjani heads the Assembly of Experts, which has the power to elect the leader, supervise him, and theoretically even to dismiss him, our correspondent says. Behind the scenes, he says, there appears to be both a political battle between two veterans of the Islamic Revolution, but also a titanic dispute about the whole future of Iran, whose outcome no-one can predict. Are you in Iran? What do you think of the current situation? What do you think of the ayatollah’s speech? 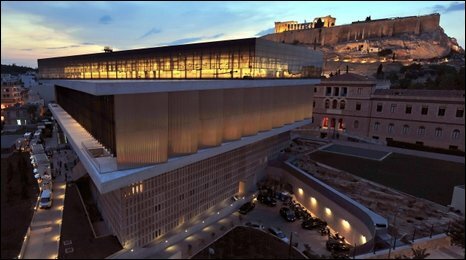 The long-awaited Acropolis Museum in Athens is to be unveiled later. The modern glass and concrete building, at the foot of the ancient Acropolis, houses sculptures from the golden age of Athenian democracy. The £110m ($182m; 130m euros) structure also offers panoramic views of the stone citadel where they came from. Culture minister Antonis Samaras said he hoped it would be the “catalyst” for the return of the Parthenon sculptures from the British Museum. Some of the sculptures, also known as the Elgin Marbles, originally decorated the Parthenon temple and have been in London since they were sold to the museum in 1817. The museum has long argued that Greece has no proper place to put them – an argument the Greek government hopes the Acropolis Museum addresses. The building, set out over three levels, holds about 350 artefacts and sculptures that were previously held in a small museum on top of the Acropolis. Antique ceramics and sculptures are displayed on the first floor while the Caryatids – columns sculpted as females holding up the roof of a porch on the southern side of the Erechtheum temple – dominate the top of a glass ramp leading up the second floor. Sculptures from the Temple of Athena and the Propylaea entrance to the Acropolis will be displayed on the second floor, while the third features a reconstruction of the Parthenon Marbles. The reconstruction is based on several elements that remain in Athens as well as copies of the marbles still housed in the British Museum. The London institution holds 75 metres of the original 160 metres of the frieze that ran round the inner core of the building. The copies of those held in the British Museum are differentiated by their white colour – because they are plaster casts, contrasting with the weathered marble of the originals. Museum director Prof Dimitris Pandermalis said the opening of the museum provides an opportunity to correct “an act of barbarism” in the sculptures’ removal. “Tragic fate has forced them apart but their creators meant them to be together,” he said. Pakistan has marked a year since the assassination of Benazir Bhutto with a two-minute silence, while thousands of mourners visited her mausoleum. President Asif Ali Zardari, her widower, used the occasion to call for peace and democracy in Pakistan and the resolution of problems through talks. Analysts say the call was also aimed at India, which blames the recent attack on Mumbai on Pakistani militants. Mrs Bhutto died in a suicide attack in Rawalpindi after an election rally. Mourning ceremonies focused on the Bhutto family mausoleum in Garhi Khuda Bakhsh, in the southern province of Sindh. UN Secretary General Ban Ki-Moon says he expects an independent inquiry into her death to be set up soon. Local police officials in Garhi Khuda Bakhsh told news agencies that about 150,000 people had travelled to the site. They came from around the country, by train, plane, car and even on foot, chanting Bhutto slogans, some wailing and beating their chests in an outpouring of emotion reports. Mourners kissed her grave and laid flowers at the mausoleum, where official ceremonies were delayed because the site was shrouded in winter mist and fog for much of Saturday morning. These were her devoted supporters, but many other Pakistanis were also feeling the loss of the charismatic politician, famous abroad and at home, our correspondent says. Prime Minister Yusuf Raza Gilani paid tribute in a televised address, saying Mrs Bhutto had “worked for poor segments, for poor people and she was the only ray of hope for the people of this country, she was a hope for the region”. Mr Zardari delivered a televised speech from the family home in Naudero, Sindh. “Dialogue is our biggest arsenal,” he said. “The solution to the problem of the region… is politics, is dialogue and is democracy in Pakistan. Thousands of police officers have been deployed in Garhi Khuda Bakhsh, amid fears that Mr Zardari could also be targeted during his visit to the mausoleum. Eulogies to Bhutto gloss over her mixed record when in power and her controversial decision to make a deal with Pakistan’s military leader, Gen Pervez Musharraf, in order to return from exile, our correspondent adds. But her assassination by suspected Islamist militants shook the nation to the core and although Bhutto’s Pakistan People’s Party and her husband swept to power in the wake of her death, there is still a feeling she left a vacuum that has not been filled, she says. Pakistanis are missing her political experience and international stature, as they face crises ranging from a raging Islamist insurgency to dangerous tensions with India, our correspondent notes. Pakistan has redeployed some troops from the north-west to strengthen its border defences, while India has advised its citizens against travelling to Pakistan. On Friday, the UN secretary general expressed hopes that a UN investigation into Mrs Bhutto’s assassination could be set up in the near future and said he was committed to helping Pakistan’s search for “truth and justice”. Earlier this year, British detectives investigating the fatal attack in Rawalpindi said Mrs Bhutto had died from the effect of a bomb blast, not gunfire. Their account matched that of the Pakistani authorities. But Bhutto’s party has insisted she was shot by an assassin and accused the government of a cover-up. 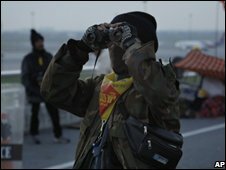 About 40 empty planes have flown out of Bangkok’s international airport after authorities reached a deal with protesters camped there for seven days. Thousands of travellers have been stranded since anti-government groups took over two airports last week. The deal allows a total 88 planes to be flown out to other Thai airports, where it is hoped they can evacuate some of the blockaded tourists. The crisis has economically damaged the country since it intensified last week. Thailand’s deputy premier for economic affairs is reported to be meeting senior figures in commerce, industry and tourism today to discuss the damage being done. As the backlog of stranded foreigners grows with each day, foreign embassies are beside themselves with frustration. A spokeswoman for Airports of Thailand said: “Thirty-seven aircraft have left Suvarnabhumi (international airport) since the first aircraft of Siam GA (a regional airline) took off on Sunday evening. Twelve planes belonging to foreign airlines are stranded at Suvarnabhumi, as well as 29 from Thai Airways, 16 of Thai Airasia, 15 from Bangkok Airways, and 22 aircraft from other airlines. With thousands of British citizens among the estimated 100,000 travellers, a spokesman for the UK’s Foreign Office said: “Bangkok’s two main airports remain closed but airlines have been able to arrange flights and transfers to and from alternative airports. “Some British nationals have been able to fly out but not in the necessary numbers. Chiang Mai, in the north, is 700km (435 milies) by road from Bangkok, while the other option – Phuket, a resort in the south – is 850km (530 miles). France has said it will send a “special plane” to fly its citizens out of Thailand on Monday, with “those in the most pressing situations…given priority,” AFP news agency reported. Air France-KLM has already said it would fly travellers out of Phuket. A few airlines have been using an airport at the U-Tapao naval base, about 140km (90 miles) south-east of Bangkok. On Sunday more than 450 Muslim pilgrims stranded at the international airport were taken by bus to the base where they were to board a plane for the annual Hajj in Saudi Arabia. Spain and Australia have been arranging special flights to evacuate their citizens. Thailand’s tourist industry is losing an estimated $85m (£55.4m) per day, and the government warns that the number of foreign tourists arriving next year may halve, threatening one million jobs. The protesters from the People’s Alliance for Democracy (PAD) are a loose alliance of royalists, businessmen and the urban middle class. They opposition want the government to resign, accusing it of being corrupt, hostile to the monarchy and in league with exiled former Prime Minister Thaksin Shinawatra. An explosion in Bangkok has killed at least one anti-government protester and wounded more than 20. The pre-dawn blast rocked an area where demonstrators had set up camp in the city’s Government House compound. Protesters from the People’s Alliance for Democracy (PAD) group have occupied the area since late August. They are demanding the resignation of Prime Minister Somchai Wongsawat’s government, saying it is too close to ousted former PM Thaksin Shinawatra. The demonstrators said a grenade had exploded near the main stage of their protest site at about 0330 (2030 GMT Wednesday). The protests have seen some of the worst street violence since pro-democracy activists challenged Thailand’s army in 1992. The PAD has proved a remarkably resilient movement, forcing the resignation of a prime minister and two cabinet ministers, and nearly provoking a military coup. While the protesters have been targeted by small bomb attacks in recent weeks, the latest explosion could herald the start of more aggressive efforts to dislodge them, our correspondent adds. An alliance of conservative and staunchly royalist academics, activists and business people, the PAD accuses Mr Somchai and his recently-ousted predecessor, Samak Sundaravej, of simply being proxies for Thaksin. The PAD wants to replace Thailand’s one-man, one-vote system with one in which some representatives are chosen by professions and social groups rather than the general electorate. Thaksin, Mr Somchai’s brother-in-law, was forced from office in a military coup in 2006 and remains in exile overseas. The new government says it wants to start negotiations with the PAD. But it is also pushing ahead with controversial plans to amend the constitution – a key grievance of the protesters who see it as part of a plan to rehabilitate Thaksin. It accuses him of corruption and abuse of power while he was in office, and has suggested he and his allies have a hidden republican agenda – a serious charge at a time when the country is beset by anxiety over the future of the monarchy. 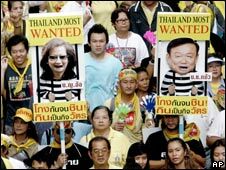 Thaksin was last month convicted in absentia of violating conflict of interest rules, and still faces several other charges. Police in Swaziland have detained a number of pro-democracy activists planning a border blockade ahead of parliamentary elections in the kingdom. Several union leaders were bundled into police vans at the main border crossing with South Africa, organizers of the planned blockade said. Political parties are banned in Swaziland, one of the world’s last absolute monarchies. There have been recent protests calling for change and multi-party democracy. A government spokesman has said the planned blockade was unnecessary. But the secretary-general of the Swaziland Federation of Labor, Vincent Ncongwane, said protesters wanted to demonstrate that Friday’s elections would not be inclusive. “We still have in Swaziland this myth that you can have a democracy where there isn’t the participation of other political parties,” he told. Landlocked Swaziland is almost entirely surrounded by South Africa. An emergency summit of South American leaders has opened in Chile to address deepening tensions in Bolivia. In the last week, at least 30 people have been killed in violence between government supporters and opponents. Bolivian President Evo Morales has likened the unrest in opposition-controlled regions of his country to an attempted coup. 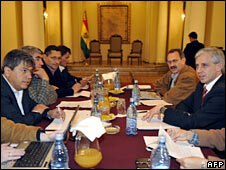 He said the meeting was important as democracy had to be defended not only in Bolivia but all of South America. The unrest represents the most serious challenge to Mr Morales since he took office almost three years ago. Chilean President Michelle Bachelet called the emergency meeting of the Union of South American Nations (Unasur) on Sunday, to help resolve the crisis. Arriving in Santiago, Evo Morales said he had come “to explain to the presidents of South America the civic coup d’etat by governors in some Bolivian states in recent days”. The unrest centers on his decision to hold a referendum on a new constitution in December. Mr Morales says he wants to re-distribute Bolivia’s wealth and give a greater voice to the large indigenous community. But opposition leaders oppose the plan and demand greater autonomy as well as more control over natural gas revenues in their areas. 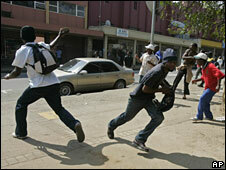 Trouble has flared in several eastern provinces and cities, with opposition supporters occupying government buildings. On Friday, Mr Morales declared martial law in the Pando region, which has seen deadly clashes between rival factions. Most of the leaders of Unasur’s 12 member-nations are attending the summit in a bid to solve the crisis. 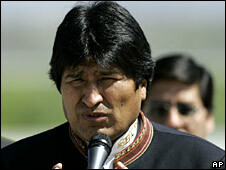 The correspondent in the region says that no one in South America wants the situation in Bolivia to escalate. Neighboring Brazil and Argentina are particularly worried about their supplies of natural gas, which come from the east of the country where the dispute is at its most severe. But, our correspondent adds, it is not clear what the meeting in Chile can achieve. Representatives of Bolivia’s opposition are not attending the summit. There have been some talks between the two sides, however. On Sunday night Bolivian Vice-President Alvaro Garcia met opposition representative Mario Cossio, the governor of Tarija province. They agreed to hold more talks when Mr Morales returns from Chile. The unrest in Bolivia has triggered a downturn in relations with the US. Last week Bolivia accused the US of supporting the opposition and expelled its ambassador. Venezuela followed suit to show solidarity and Honduras has refused to accept the credentials of a new US envoy. Venezuelan President Hugo Chavez said the unrest in Bolivia was “a conspiracy directed by the US empire”, likening it to the 1973 CIA-backed coup which ousted Chile’s President Salvador Allende. The US says it regrets the recent diplomatic expulsions and has rejected Bolivia’s allegations against its ambassador.